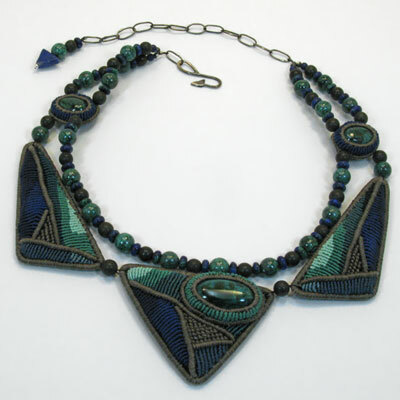 A Egyptian deco piece, with three Eilat cabochons and knotted in a geometrical Cavandoli style of micro macrame within triangles. Eilat comes for Israel, from the area of close to the Red Sea. Eilat is chrysocolla intermixed with turquoise and malachite also known as 'King Solomon Stone'. The Cavandoli knotting is densely knotted with silk and nylon thread. Additional beads are pyrite and lapis/malachite compound beads mad by mixing lapis powder and malachite powder in resin. The chain and clasp are hand fabricated out of sterling silver and have been oxidized. This is a piece for a modern goddess, yet it can still be worn casually or displayed as a miniature in a shadowbox frame. 3 Eilat cabochons. Eilat, pyrite and lapis/malachite resin beads. Jade rings and toggles. Silk filament thread and nylon cord. Sterling silver. Copper armatures. Leather lining.